Whether you were a teen in the late sixties or in the early to mid seventies, chances are pretty much one hundred percent that The Guess Who or Bachman Turner Overdrive banged around a bit on your ear drums. Songs like “American Woman,” “Undone,” “These Eyes” or “Takin’ Care of Business,” “You Ain’t Seen Nothing Yet,” and “Let It Ride” dominated the airwaves in those days, insuring that those tunes are indelibly burned into the recesses of our minds. Joining Bachman’s three piece band in recording the album are heavy weights like Peter Frampton, Neil Young, Joe Bonamassa, Robert Randolph, and the late Jeff Healey. The result is some amazing, new blues that will blow you away. 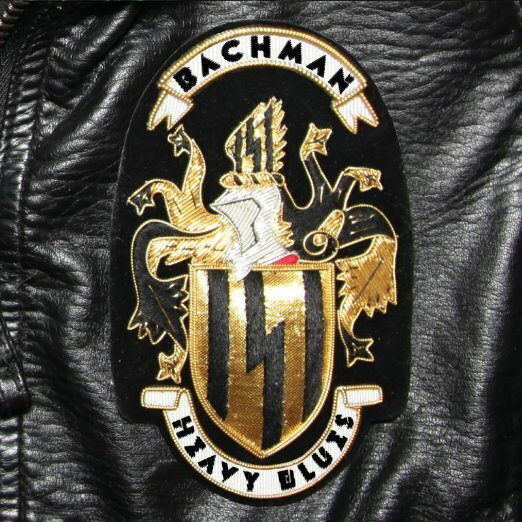 Boomerocity recently chatted with Bachman about “Heavy Blues.” We started out by talking about what was different about making this album compared to all of the other albums he has recorded. “Well the first album I made was with The Guess Who. This is very similar in that there was no over dubs. It was live off the floor. If you made a mistake you lived with it. You embraced it. “I remember when we cut “Shaking All Over” in 1964, we took the version that had the least amount of mistakes. You're sitting on pins and needles. You're playing a brand new song. You don't really record songs that you've been playing for 10 years. You're doing a song you've just written or you're copying a song or you're doing a cover of a song you've just heard. So you're all sitting in the room on chairs and it's all recorded mono or 2 track and somebody makes a mistake you start over and it goes on and on. “As you get near the end if there's a mistake there you leave it in and that's the great thing about some old classic records is little notes and bass notes and endings and things that are there that kind of give it some charm and shows that it's real people. “So that was the same cut in this album, it was live with the girls. We had no rehearsal. No getting to know each other - none of that. I found a great drummer. I found a great bass player. I thought, ‘I'm going to do something weird, I'm gonna get two ladies to back me up.’ They play incredible. One plays like Jeff Bruce and John Entwistle on bass and the drummer plays like John Bonham and Keith Moon on drums. Holy cow this is the British blues! This is what I always wanted. Wildness! “Have you ever seen the black and white from BBC - the early photos of Led Zeppelin? You can Google that. John Bonham doesn't play the drums. It's literally like he's chopping a tree down with an axe. He's just pounding the drums. If you look at Cream with Ginger Baker, it's the same thing, He’s just pounding the drums. The bass player is hammering away at the bass. “I said, ‘That's what I want. I don't want a little light, polite groove. I don't want a 2 and 4 and 1 and 3 on the kick and snare. I want a maniac. I want Keith Moon drums.’ He was the most exciting drummer. The next exciting is John Bonham with his most incredible sound. He'd leave spaces and then he'd fill the holes up. “This is the kind of what I want in these songs. I'm writing new songs. I'm writing blues songs, which has a lot of spaces and not a lot of chords. There's accent on the lyrics. I'm writing really bluesy lyrics for the first time about the devil and the devil made me do it and all the blues songs - a Rufus Reid kind of thing. I didn't tell them anything other than just to let it rip and play everything they ever wanted to play on record that nobody would let them play cause it went a little wild. “This is the first record that I've been in love with once it's done because when it's usually done I'm so sick of it, I've lived with it so long and overdubbed it so long, it's enough already. This is so fresh and new and happened so quickly -like in 5 days recording and 5 days of mixing and after the solos came in because obviously the guest soloist were not there. We had to send them (the guest soloists) the tracks and get them back. Kevin Shirley laid them in and sent them to me one at a time. “The solos were such a revelation of such incredible guitar playing and these guys giving a bit of their heart and soul and personality to each song. It just blew me away. As a guitar player, if I wasn't on this, this would be one of my favorite albums. The guitar playing from each guy gives each song such a distinct look into their own style laid up against blues thing. For me it was just a wonderful experience. Artists typically have their tunes worked up and ready to record before running the clock on expensive studio time. I got the impression from Bachman that this wasn’t the case so I asked him about it. “I had a couple of songs because I knew I was going to try a blues thing. I was going to do a tribute to a lot of blues artists. I had a Howlin' Wolf song. I had a Frankie Lee Sims song. Guys that I had their 45's. I got all my 45's out and even 78's. This is how I learned to play guitar. I got out Muddy Waters and I go to Jimmy Reed and I had them in my song list and I was there in the studio and I start to play. Kevin Shirley would come in and say, ‘What is this?’ And I say, ‘Well this is Jimmy Reed my favorite song, Baby What You Want Me To Do. I've been doing this since I was 15 years old. “He said, ‘Yeah, but everybody else has been playing these songs. You can't do cover songs if you're going to do a blues album. Haven't you heard like 2 years ago Jimmy Ray Vaughn and Al Omar from the Howlers did a whole Jimmy Reed album?’ I said yeah, ‘I saw them on TV doing their song. He said, ‘Yeah, well, it's already been done. Everybody's done Close To You Baby by Bobby Blue Bland. There's another song that I love. “So I take Baby What You Want Me To Do and that becomes my first line in Learn To Fly, Fly Away and I'm singing it like Jimmy Reed would do it but it's faster, it's sped up like ZZ Top doing LaGrange. “So, Kevin comes in and says you can boot all these songs up, if this is heavy blues it got to be heavy and fast so kick everything up a notch. So once we did that we got into this late 60's British trio power trip like Hendrix and Cream and The Who and Zeppelin and we just had the time of our lives. It's just as if we went to a party and found old drums and old bass and old guitars and said, ‘Let's do late British blues for an hour and played Sunshine Of Your Love and My Generation and Whole Lotta Love and then went home and forgot about it -like a Wayne's World kind of thing. But we did it and we kept it and it's become the album. We can't wait to play on stage and do this cause it is such a flashback to the late 60's. I was dying to ask about all of the artists who contributed to this album but we were short on time so I asked what the story was on the Jeff Healey contribution. “Well, he and I were great friends. We both had radio shows on CBC where he explored jazz. He collected old jazz 78's and he would play them on his radio show. l have a radio show that's still going called Randy's Vinyl Tap on every Saturday night. I play all my old vinyl and I tell the stories behind The Who, Zeppelin and The Beach Boys. Everybody I've met and I tell my own stories that aren't in any bio or Wikipedia. It's me and Elvis or me and Duke Ellingtion and whoever the stories about. “So, we had that in common and every time he would be playing around Victoria, Vancouver, even in London, I'd call him up and he'd invite me down and I'd go and see his gig. I'd have dinner with him and the band. I'd go on stage and play with him. There's a wonderful video of me playing with him at Islington Music Center Academy in London doing While My Guitar Gently Weeps. When I watch it brings tears to my eyes because that's one of the last times I played with him. “Right after that I recorded live with him at Massey Hall in Toronto and I was going to put it on an album. It just never happened. I got busy doing other things and he got serious cancer and passed away. I thought here I am doing Jeff Healey's stuff and so I sent a little email to his wife, Cristie. “She said, ‘Oh my God! Jeff would love to be on this album with you. You have my blessing. I'll send you his amp, I'll send you his guitar.’ I said, ‘No, I just need permission. He and I recorded a BB King song called Early In The Morning. It was one of his standard encore kind of songs. So I write a song that was in the same beats per minute and I'd leave it all in the key of G and it becomes, Confessin’ To The Devil. Every lick that he plays fits into this and you'll notice, if you listen to the song, he sounds very much like BB King because he's actually playing BB King’s licks from Early In The Morning, which is one of BB King's great signature songs and one of Jeff Healey's. “It fits in there like he's in the room. When I'm doing it, it's like, Jeff is here. ‘Hi, Jeff. Nice that you showed up.’ He's kind of there in spirit. It's pretty amazing. “Joe Bonamassa was one of the first ones in and once Joe was in it gave it real credibility and I thought maybe I should invite a couple of other guys to play. So, after I got Joe Bonamassa, I got Jeff Healey, I think I'll ask a couple of other guys. “They'd send me the stuff and we'd comp it and lay it into the mix and send them an MP3 back to get their okay. Everybody loved it and everybody that came that did their solos just blew me away. Some guys couldn't show up for the gig. Like, I was waiting on Billy Gibbons, who was on tour and he couldn't do it. Neither could Kenny Wayne Sheppard. So now my label is already asking me for the next album. Yeah these guys are left over cause they couldn't do it because of scheduling. I had a deadline to get it mixed and mastered. 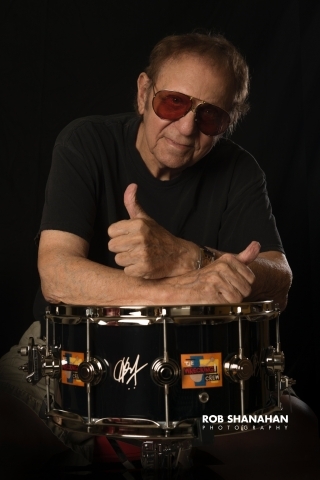 “Having seven guys in there as guest soloist was enough that it gave me time to leave some of my solo playing in there ‘cause I can still play pretty good. It led my way to a contest where now once you buy the album you could go to a website and get the seven songs without the solos. So if you're little Joe Guitar Player and your 14 or you’re 40 or whatever age you are, it doesn't matter - or if you're a woman it doesn't matter. You download these songs without the solos. You play your own solos. You YouTube it. You put it up on YouTube and when I come to that town we are going to have – with the radio stations - you can come on stage and play that song with me when I'm playing in Cleveland or Texas, whereever I'm playing - or L.A, whatever. “You'll get a brand new Epiphone Standard Les Paul. You'll get a couple sets of guitar strings and heavy blues guitar picks and you come on stage and play this song with the Bachman band. You play Taking Care Of Business and you become a little guitar hero on your own little corner of the world. That's a contest that's going to be running. “Q107's going to do it in Toronto. It's going to be like The Voice because when you hear a guitar solo, you wanna know who it is. You're going to say, “That's a good guitar solo. Who is this? Oh, it’s Jimmy Smith or it's little Jody Smith. Let's call them up. I'm playing in Cleveland or I'm playing in Dallas in a month or in 3 weeks. Have them get ready and have the radio station hype it up.’ They’ll come on stage and play with me and, because they won the solo thing, they get the guitar. “If you go now to 'Randy’s Heavy Blues’ on Amazon or Itunes and pre-buy it, when it comes out in April, you would get a couple of free downloads that aren't even on it. And you'll get the song Heavy Blues, which is the one Peter Frampton is soloing on is one that you can play a blues solo over it and send us your YouTube of you playing in with your own band. If we like it then you win that contest. “We're giving two hundred Epiphone Les Paul guitars, ten thousand sets of Optima heavy blues guitar strings, ten thousand guitar picks from Tusk, which make a wonderful triangular heavy pick that has harmonics in it that will give you that Billy Gibbons sound. I got the same kind of harmonics on Wild Texas Rider, if you listen to my solo of these double high harmonics when you're playing the notes from this Tusk guitar pick. We have these contests that are going to be amazing. This is going to be an album for all guitar players to get because the amount of guitar soloing on it by some of the greatest in the world is pretty mind boggling." “Early April is the big kick off at the big classic rock station in Toronto, Q107, where they're gonna have the contest with the winning solo gets to play with either, we're going to announce the winner, gonna have a big club date at a rock and roll club here in town. And we're going to do that in Montreal and then we're going to do that in Hamilton. Then ,we're going to the west coast of Canada and working my way across Vancouver, Calgary, Edmonton, that kind of thing. “In the middle of April, we're doing the Cleveland Blues Festival and the Chicago Blues Festival, where we're going to run the same contest. We're taking offers. We just got one from California yesterday. Radio stations said they love the idea of the contest. We’re going from New York - they love the idea of the contest. They want to run it. They want to promote the whole thing give away the guitar; have a lguest soloist appear. Play on stage. So, where ever we're getting phone calls from different radios or different cities, we're now planning a tour of maybe Hard Rock Cafes or Houses of Blues or radio stations promotions. “This is like the 70's again, where we're getting into radio stations promoting stuff. I can't believe it because I put out this record thinking I'm not going to get any airplay and I don't even care. This is for me and all guitar players out there. Maybe the internet will do something. I'm not really savvy on how much the internet can do yet because I'm not Justin Bieber with 30 million followers. I don't even do Twitter because I don't want people to know where I am. I enjoy my privacy. “Things are starting to happen. I'm getting incredible response from guys like yourself who are previewing the album and radio that are hearing it. 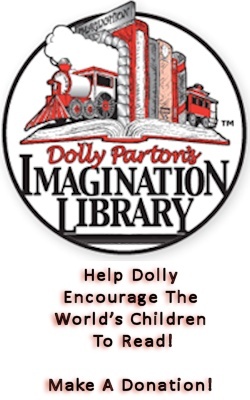 We want to do this contest. This is like the 70's again. You’re bringing some life back to radio. It's interactive with the crowd and listeners and everybody's getting in to it. “I got to thank Gibson/Epiphone Guitars. I’m getting a couple hundred guitars. Thirty for Canada. Thirty for England. One hundred for the states. Thirty for Germany. So I've got to suddenly be everywhere in the world at once. So we're trying to balance it out. I can do a few in Canada, a few in the states, a few in England, a couple in Germany. Come back to the states and do a few more. “You can't go out and lose money so you've got to get a big money paying gig and then you fly and do a couple of promotions gigs around something else. The radio station might rent a club. So you could have the door and it will hold twelve hundred people and run the contest so I can get there. I've got a record label that has said anything you do we'll support you. That hasn't happened in decades. I feel very blessed and fortunate and lucky. I'm actually in training now for what's coming. For me, it's a marathon that starts early April. A bloody marathon. 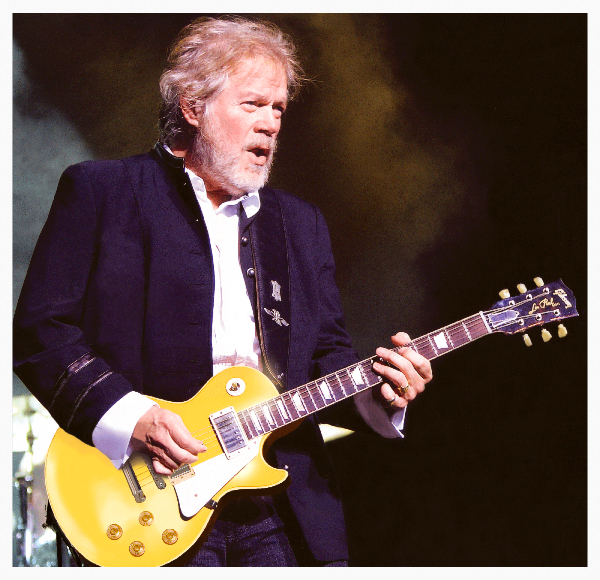 As we wrapped up our chat, I asked Randy Bachman what he hoped his legacy would be and how he wished to be remembered.